Quantum entanglement verified by experiment. The article makes much of how Einstein derided quantum entanglement. What the Times seems to missed is that it was Einstein who also said that one experiment could prove him wrong. Which this did. Which makes for interesting physics, which is after all, the study of the world as it is, not as we would like it to be. You can make up all the theories you want, but ultimately you have to test the theories against reality. Which doesn’t care how elegant your math is or how well your theory fits together. Reality is what is. As a true scientist, Einstein understood that and that’s why he would have loved this experiment. I guess some people didn’t show up for the party and they had too many leftovers. Interesting find though. In order to prevent climate change, create Morlocks. It’s for the planet. This is typical of the kind of thought that’s been driving the Progressive movement since HG Wells. So I should not be surprised that the same sort of bad stuff keeps coming to the surface. I suppose that it should be no surprise that the article should be written by high status Eloi, Rose Eveleth, she who loves science so much that she drives scientists to tears over a shirt during their greatest triumph. She does talk a little about who gets to choose who gets modified and what modifications happen. I do want to know who “we” is. If experience in the last century is any guide, who “we” is and who makes the kind choices about people is fairly evident. Unfortunately for Ms. Eveleth we have an all too good series of examples of Been There, Done that. Frankly we don’t want to go down that road again no matter how hot it gets. Unfortunately Progressives can’t seem to learn from past mistakes. They always seem to want to go down the same paths. They can’t seem to understand that 1984, Brave New World and The Time Machine were warnings, not instruction manuals. I think that even some of the Progressives of the last century were every concerned about the possible consequences of the things that they were advocating. Somehow they didn’t follow that logic to the conclusion that they were advocating for the wrong things. At this point, the climate change argument misses the point. Even if things were as bad as the climate crowd says, do we really want to, in the end even give up our very humanity. Do we really want to want to remake people in to some sort of ideal chosen by a few based on something that at best is a good “maybe.” Frankly though, it would be easier to deal with the Ice caps melting than with the social changes wanted by the “we” crowd and the consequences of same. It’s amazing how these people always come to the same conclusions, that somehow humans must be coerced into becoming new people, better suited to the new world, whatever that is that the Progressives are pursuing in their current fad. Now, apparently the want to reach into our very genes and “nudge” us into a new species. It seems like every new go around of Progressivism creates yet more new coercive lunacies, to top the bloody past that’s already happened. I can’t understand the logic that says that all of us should inflict permanent damage on our children to chase the will of the wisp. The fact is that nobody really knows what the climate will do. 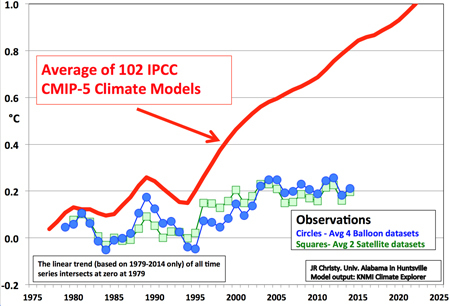 Computers are not oracles and like all models the climate models are at best, guesses on reality. The evidence seems to be that they a poor guess at that. especially when it comes to the potential effect of rising Carbon Dioxide. It bothers me when supposedly intelligent men seemingly ignore chemistry and physics when chasing horror stories. Especially when they are trained in those disciplines. Maybe they should be afraid. I took my time machine to the future and my Morlock friends told me that Eloi was pretty tasty. Like chicken, but they can’t eat chicken. They are genetically allergic to it. Look, when people come up with “solutions” like this, it’s pretty obvious that things have gone way off the deep end and that this is NOT the way to go. But I’m sure that shortly we will see soon yet another lunatic suggestion from the climate crowd, just wait. From Watts Up With That. I guess they think that you can always drug up the Morlocks they create. This post point out just how many oscillators there are in the climate system. I don’t think that the post got all of them as there are some local ones and the ocean oscillators such as the PDO. The real problem is that for a computer model to take all these into account you would first have to know some baseline temp and inputs to get the coefficients to get updated temps to get new coefficients and so on and so on. If you have large temp differences you can wing the approximations and keep the computer time from being completely insane. When you are dealing with the atmosphere and low delta T’s and energy transfers you are sitting right in the margins of errors. Use bad approximations and coefficients and you model is going to be garbage. More from Watts up with that. One would expect the ball to melt it’s way through. It doesn’t because floral foam is a foamed thermoset plastic which burns rather melting. Had the foam been styrene or another thermoplastic foam the block would have melted. But enough of that TMI crap, just watch the video. Ran into this today on Machine Design. I did some follow up, here. I’ve got some ideas for improving their source, but without access to a mass spec, there’s no point in following up. I think I will sketch them up in a book.